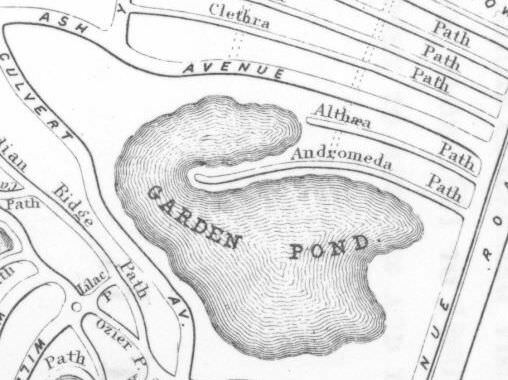 Early maps of Mount Auburn (such as the 1831 map section seen above) show a large three-lobed pond in the northeast corner of the Cemetery. The pond was then labeled Garden Pond, and it covered much of what is now Ash Avenue and the Administration Office & Story Chapel. It was originally envisioned as a backdrop for the experimental garden associated with the cemetery during its earliest years. 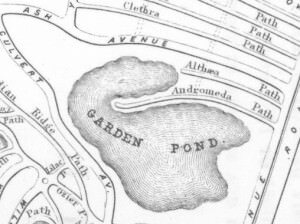 In 1856 the stagnant, muddy western lobe of Garden Pond was filled with gravel taken from “a hill near the gate.” Filling of Garden Pond continued gradually for the next fifteen years. 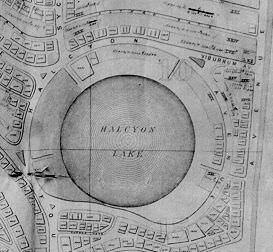 In 1862 the Trustees voted to turn Garden Pond into a lake, and in 1864 it was renamed Halcyon Lake and Halcyon Avenue was laid out around it. Many valuable lots were created on the banks of the lake. 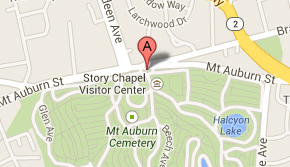 In 1870, Ernest Bowditch was assigned by Shedd & Sawyer to supervise work at Mount Auburn Cemetery. Included in his work was the laying out of Halcyon Lake. He later recalled: “when I looked at the working drawing and realized that Halcyon Lake was a perfect circle, I had a chill run down my spine.” Granite curbing was installed at the perimeter of the Lake, but was later removed.